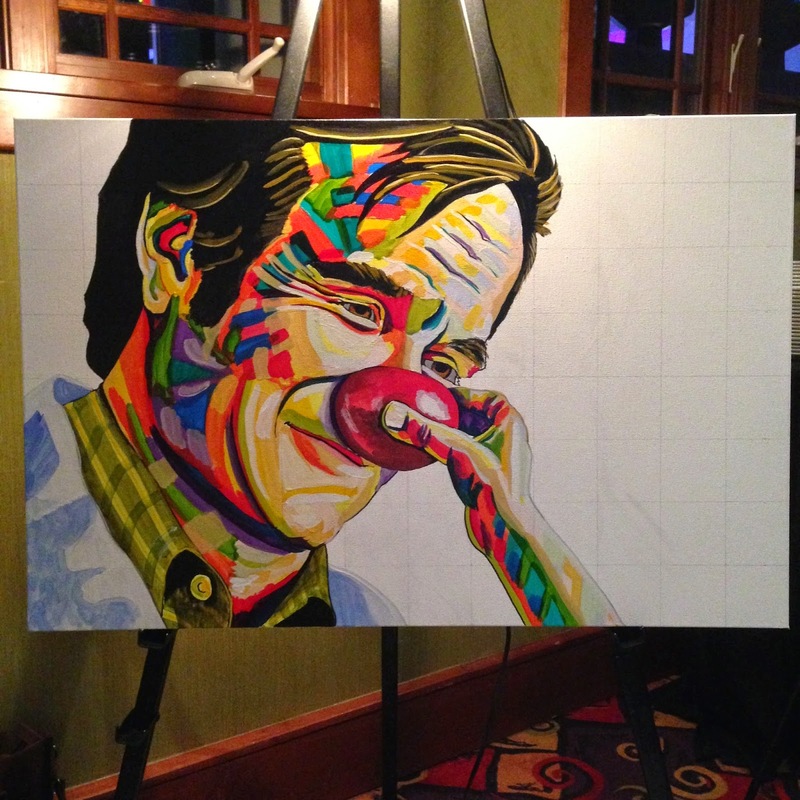 I couldn't sleep on the late night flight home, so I reviewed our incredible day in Calgary and the process of painting Robin Williams as Patch Adams in front of a full room of people at the Deerfoot Inn and Casino. They had gathered there for the fourth annual NorthStar Ford Canada Group Charity Poker Tournament. 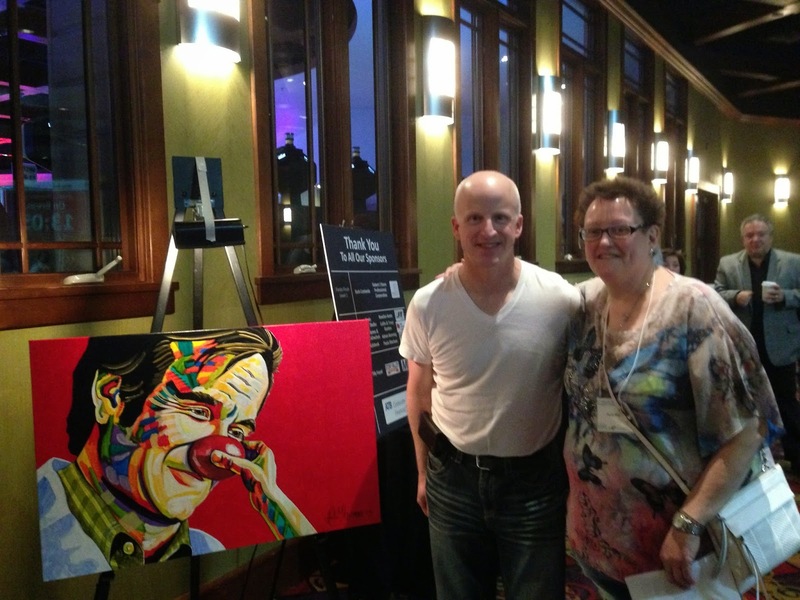 The painting was about to do was one of the live auction items. My alarm goes off. I get up and go upstairs, where it is oddly quiet. Nobody is stirring, not even Simon, my 18-month-old nephew. People start to get up and I’m able to find out from Michael, my brother-in-law, where the canvas has been stowed, purchased the day before by my father-in-law, who was also in town visiting. Thank God we didn't have to travel with an awkward canvas. 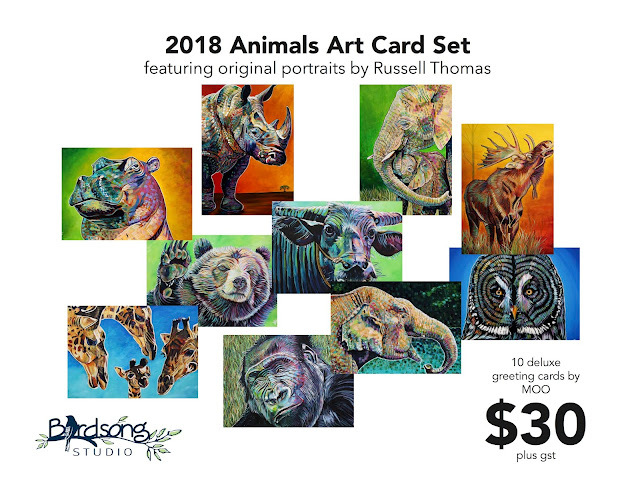 I begin to draw my grid on the 24” x 36” canvas, a series of 3-inch squares covering three times the area than the source photo which had been previously gridded with 1-inch squares. I start drawing out the image of Robin Williams as Patch Adams, starting with his hairline, working my way to the cut of his doctor’s coat and shirt, before tackling the more difficult elements of his face. In order to get to the Deerfoot Inn and Casino in time, I know I have to leave by about 8:30 am. The drawing is almost complete. I load up the pre-drawn canvas, toolbox full of painting supplies, camera and laptop bag and head out. Traffic is slow as it is a Sunday morning. I should be able to make up time on the Deerfoot. I pull into the parking lot, getting as close to the casino area as I can, trying to reduce the distance I have to lug all my stuff. I know the casino doesn’t up until 9:30am, so I ask a worker having a smoke how to get into the Chrome Room. The security dude lets me in and I am able to drop off all my stuff. Shoot! I left my cell phone in the car. I head back outside, grab it, then go searching for something quick to eat. I’m kind of hungry. I manage to find an energy bar in a vending machine – breakfast. I meet Marty and Dennine Giles, the hosts of the fundraiser, as I make my way back to the still unopened casino. We find a way in through an adjacent ballroom and I begin setting up next to where the poker tables will eventually be set-up. The light isn’t great but it will do. The easel provided by the Casino is perfect, able to hold the canvas at just the right height. Paints unpacked, drop cloth laid out on the floor, and water in my jar, I’m ready to begin painting. It is four hours to auction time. Most of the volunteers have arrived, poker tables are getting set-up and my eyes are already tired from straining to see in the low light conditions. Two hours to go and the piece is starting to come together. I still don’t know what I’m going to do with the background as I finish up the shirt and the doctor’s coat. There is still some detailing to do, but I know I’ll have time at the end to do that. Red. It’s got to be red, I think to myself. Maybe I speak it aloud; at this point I don’t know whether I’m talking to myself or not. I need to get the background done early so it has time to dry before doing the signature. Time to do some last minute detailing, strengthen some lines, fix up a couple of spots, and add a white highlight on the right side of his face. Rick Achtymichuk pops into the room. Rick is from my hometown of Kamsack, Saskatchewan and has been following my painting from a distance on Facebook. He says he and his wife Suzanne were on their way to an auto show when he saw my posts. Marty has worked his way through the live auction items. “Russell, you done?” he asks. “You bet,” I yell, grabbing the painting and heading up to the front of the room, filled with about 150 people, including a couple a familiar faces from back home and others who used to live in Fort McMurray, like Kirk Bailey, former Executive VP at Suncor. The bidding starts with a $2,000 bid from Marty himself. "Five thousand," someone yells from the back. Very quickly it becomes a back and forth affair with two bidders on the far end of the room. It eventually closes at $6,300. I am stunned. I get a picture with Paula MacLean, the happy purchaser, and long-time manager at NorthStar Ford in Fort McMurray. She arranged the financing on the very first vehicle I bought in town back in 1997. I spend the next 45 minutes finishing up the edges of the painting, grabbing an archival photograph, and packing up my gear. “I’m heading out,” I say to Marty, giving him a big hug. I’m typing this timeline on an Air Canada flight back home. We’ve started our descent into Fort McMurray. It has been a remarkable day, one I’ll never forget. 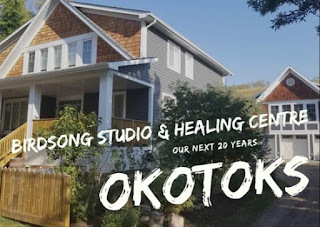 The interest in the project has generated a number of new opportunities and a couple of commissions. I’m numb. The fact that a painting that took five hours sold for that much money still hasn’t sunk in. 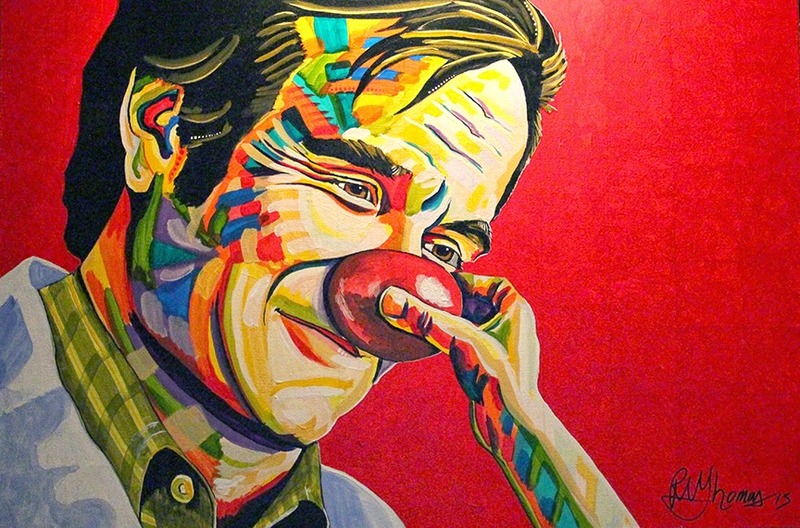 I remember being shocked when the first Robin Williams sold for $2,500 for charity. This is something of a completely different magnitude. I thought a lot about my son Dylan while painting today. There is a large piece of him - his story, his spirit - in the portrait of Patch Adams. Born two months early in 1999, he has overcome many obstacles in his life and has been greatly influenced and supported by hospitals. That the money raised today is being split between two amazing hospital foundations in Calgary and Fort McMurray, just feels perfect.